First things first, you’ll want to get as much moisture out of the memory foam mattress as possible. Blot the stain with fabric or paper towels, but don’t scrub — that could embed the urine deeper in your mattress. The worst part is over! Once you’ve blotted out all the moisture you can, cover the stain with vinegar and let it soak for about thirty minutes. The vinegar will help neutralize the urine smell. Back to blotting. Dab the vinegar with a new towel. While you don’t have to absorb all the moisture, make sure to blot out as much as you can. 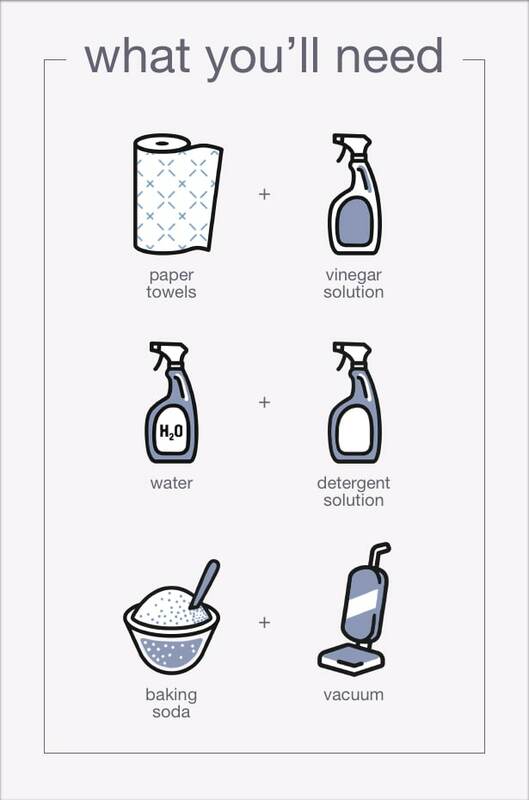 Fill a spray bottle with half laundry detergent and half water and shake it well. Spray the mixture on to the stain and let it soak for about 20 minutes. It’s time to blot again! Once the mixture has had time to soak into your mattress, absorb any excess moisture with a rag or paper towel. Don’t worry, we’re almost done! After all that blotting, you’re still going to have a wet spot. That’s where the baking soda comes in. Make sure to completely cover the stain in baking soda and let it sit for 10-24 hours to let it completely soak up any leftover moisture. As soon as the baking soda has a had a chance to soak up any remaining moisture on your mattress, vacuum it up with a handheld vacuum. Make sure to get every speck of baking soda off of the mattress. The easiest way to get a urine stain out of a mattress? Prevent it altogether. Make sure that another little accident won’t ruin your mattress by covering it in a mattress protector. When it comes to memory foam mattresses, it’s better to be safe than sorry. Don’t feel intimidated — you’ve totally got this. And once you’re done, your memory foam mattress will be good to sleep on again. Unfortunately, if a urine stain is on the older side, it might not come out. If that’s the case, it’s probably time for a new mattress. Read our Tips on Buying a Memory Foam Mattress guide to get started.